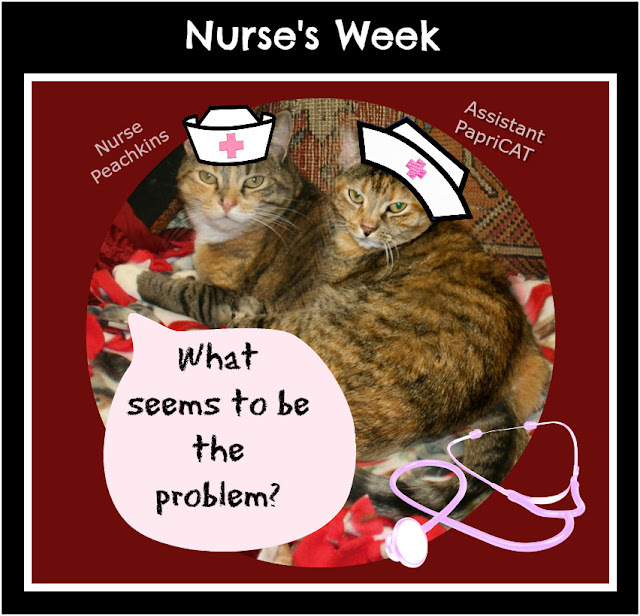 We are celebrating Nurse's Day and Week - a special time to honor nurse for their helpfulness & kindness in our lives. We may be nurses at heart because in our medical bags are many tricks which soothe the soul and body. Paprika's specialty - "THE TRILL" - A musical sound halfway between a PURR and a MEOW..., made with arched back & various rubbings, it mends broken hearts and soothes the soul. "So the first thing I do when the human is at rest is a WHISKER KISS combined with a PURR to let her/him know I am ready to take medical action. NEXT: I place one paw then the other on his or her arm and KNEAD gently, while pushing the arm. After that, I wrap my self around their arm in a fluffy embrace. I haven't even mentioned the head butts....After I'm done, the human cannot help but feel better. I really should charge big time for this!" You can read more about Nurse's Day/Week May 6-14 HERE! You two look terrific and I'll bet you are fabulous nurses! You know I thought hospitals were missing out on atrick, or two. I dare say you both could earn lots of money mice and treats giving courses in feline care and medication..... Tell me, do you acupuncture classes too? You're both pros at nursing!! Kitties are the very best nurses around! Your nursing technique description is exactly what I need! I know that I am supposed to do something...but I'm not sure what! We think us cats are the best nurses! 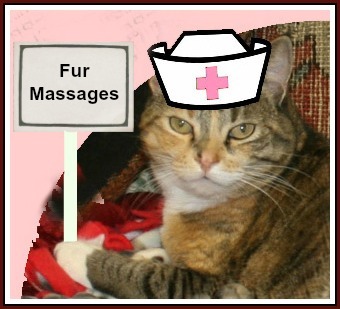 Nursie kitties are the best. Mommies agree! I know mine does!! We all have our specialties.. Marley reaches out with happy paws, Iza sits of laps, Ayla greet (when at head level) with talk and head-bumps... Cats are just natural nurses.